impact us more than we realize. There, I found Sarah Odens, a painter based in the Sioux Falls area, who uses overstimulated digital content in her body of work. Her fascination with online sources has caused these items to infiltrate her paintings. From calligraphic text to vibrant color schemes, Odens is exploring our ideas of perfection in each of her compositions. 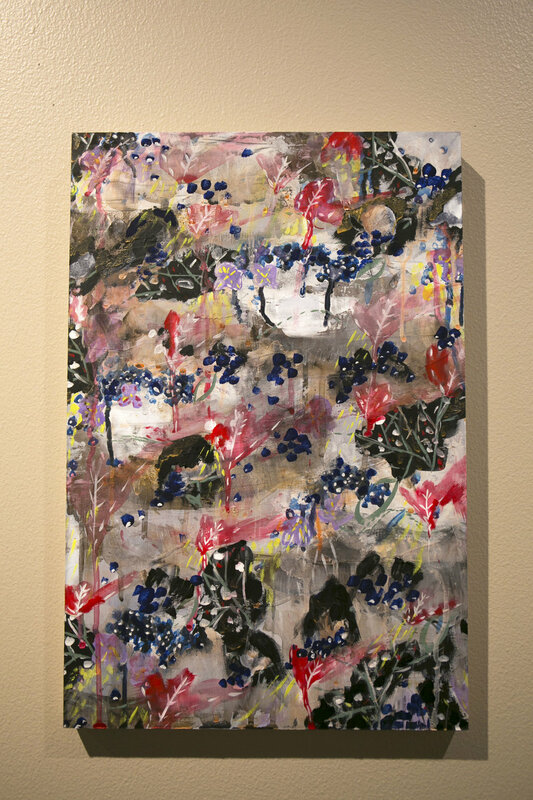 The First Friday of every month, Sioux Falls shows it’s artistic side. This past week, I went to the Sioux Falls Arts Council’s gallery space for the first time, excited to see what was in store. 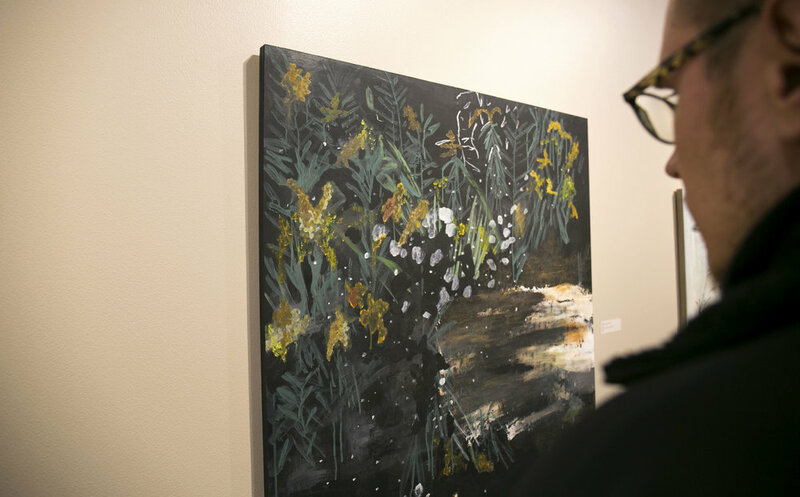 The Sioux Falls Arts Council gallery created an intimate interaction between the viewer and the painting. The small space allowed us to spend time with her work without feeling rushed to move through the exhibition. It was beautifully curated; letting each piece breathe while still feeling cohesive. Odens’ way of incorporating her fascination of digital content makes her pieces have dynamic layers. At first glance you see a painting of flowers, but upon closer inspection you find hidden messages. Her work is a perfect demonstration of what we see in the media and online. We are shown images of how society defines happiness and beauty. Some of us take this at face value. In reality, behind these images, lies deception and fabrication. When our mind realizes that these advertisements and images are not what they seem, we can decide what to believe and what to disregard. Odens’ work revealed this dialogue between what is shown and what we actually see. When we take a moment to process through our thoughts, we begin to see what society wants us to believe. But we all can understand what is truly genuine. As you move about this week, pay attention to your media intake and how it impacts your thoughts, opinions, and emotions. When we begin to question what is before us, then we can decide who and what to believe.